Kythera Summer Edition, an annual publication for visitors to ‘Aphrodite’s Island’, celebrates 25 years of publication. 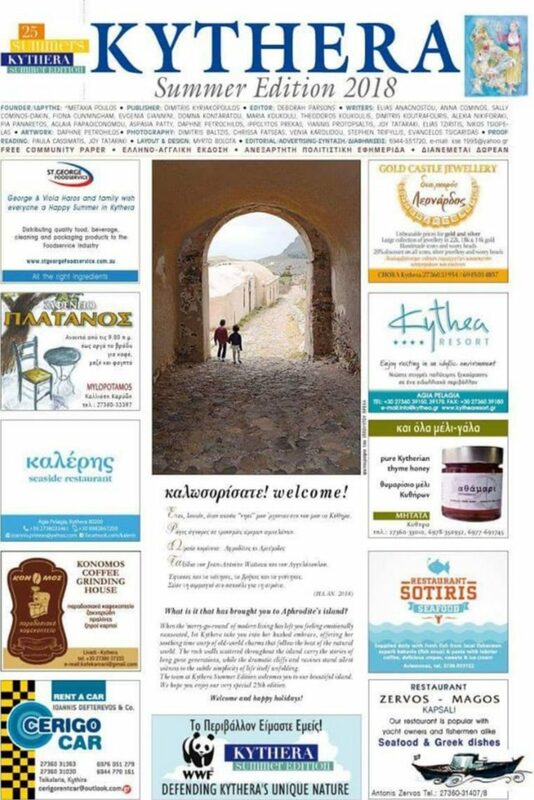 Founded in 1993 by Greek Australian Metaxia Poulos after her relocation to Greece, Kythera Summer Edition has been a staple and a point of reference for visitors to the island. The silver jubilee issue features a beautifully drawn map by artist Daphne Petrochilos on the cover, depicting Aphrodite dressed in a spalleto (local Kytherian traditional dress) holding the scales. This artwork also serves as an opportunity to reaffirm its mission statement, using the symbol of the scales as metaphor for balance. The ‘Kythera Summer Edition’ 2018.